Recorders may be made out of a wide variety of woods and other materials, which vary greatly in appearance and hardness. By far the most important factors determining the sound of a recorder are its design, style, and voicing though the type of wood may have some effect as well. Different varieties of woods have individual characteristics which tend to favor certain sound qualities. Relatively soft woods, such as maple, pear, or other fruit woods often produce a very warm tone but less volume than denser materials. Very hard woods such as ebony or grenadilla may give an instrument more volume and brilliance. NB: It is very common for players to develop an unconscious prejudice towards (or against) particular varieties of woods, based on past experiences, anecdotal evidence from friends or even appearances. A player who once tried a poorly made recorder made of pearwood may be unwilling to consider a new pearwood instrument. A player whose teacher owns a fine handmade grenadilla alto may hope to duplicate the sound by choosing a much less expensive model made of the same wood. Each individual instrument is different: we encourage you to keep an open mind. European Boxwood was the favored wood for the best early woodwind makers. Genuine boxwood of this type is extremely fine grained, and carves beautifully. However, because it is extremely slow-growing (a tree large enough to use for instruments may be as much as 300-500 years old! ), the wood is often full of knots, splits, cracks, and other imperfections. Boxwood is quite labor intensive; it is difficult to find a length large enough to make an entire instrument, so the head, center and foot are each turned from a different piece, which must be matched for grain and color. Blemishes are often not visible until the wood is turned, and a nearly finished piece must be discarded. The natural color of boxwood is pale yellow, but it is frequently stained darker colors. Early makers stained boxwood instruments to make them look more exotic and elegant, to help the different pieces of an instrument match better, or to disguise discoloration in the wood. We stain ours as well, in a variety of rich shades (the image above shows the wide range of shades we can achieve). Although they appear very shiny, our instruments are never varnished. They are sanded with very fine sandpaper, oiled, and finally buffed. The wood is so fine that it can achieve such a fine finish without varnish, shellac, or lacquer. Mid-priced instruments, such as the Moeck Rottenburgh or Mollenhauer Denner may be described as 'boxwood', but Castello, Maracaibo and Zapatero boxwoods are varieties of South American or Asian origin, unrelated to true European boxwood. They are less dense and not so fine-grained, but grow faster and straighter, making these woods far more economical to use for large-scale production. Maple is a popular choice for copies of Renaissance recorders because surviving original instruments were made of maple or similar woods. It is available in very large, consistent pieces, particularly important for Renaissance instruments which frequently require very large recorders to be made in only one or two pieces. It is also lighter in weight and for this reason, it is also used for Baroque and modern tenor & bass recorders. Maple can also be very decorative when a piece has curly, 'flamed' or otherwise figured grain. It is also used for many inexpensive recorders, and is porous enough that it is sometimes impregnated with wax under pressure to help protect the wood from absorbing too much moisture. Its natural color is very light, but it is often stained to bring out the beauty of the grain. We use American hard maple which has a sweet, warm tone and blends well with other instruments. German makers sometimes use European sycamore (also called sycamore maple), particularly for Renaissance recorders. African ebony is a very hard, dense wood, deep brown to black in color, a favorite of makers looking to produce outstanding visual pieces. Its density gives it a bright, bold, and powerful tone, which many players favor for concerto instruments where volume is a concern. The Bressan flute pictured below is made of ebony. 'Rosewood' is a generic term for a variety of woods in the Dalbergia family, including palisander, kingwood, tulipwood, and many others (so-called because when these woods are cut, they emit a faint scent of roses). Rosewoods have very colorful, high-contrast grain, striking in appearance, and ranging in color from orange through reds and purples to deep brown. We select only the finest woods for their exceptional grain and beauty. 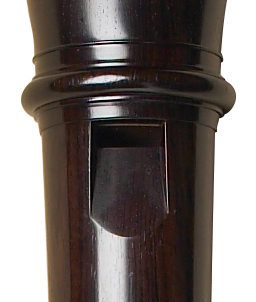 The tone of rosewood recorders is typically reedy and rich in overtones. The Rippert soprano (top, kingwood) and alto (bottom, tulipwood) below demonstrate just two possible colors. Our rosewood recorders are turned from a single billet of wood so that the grain and color match along the length of the instrument. Because there are so many varieties of 'rosewood', terminology can vary. For example, Moeck produces recorders in both palisander and tulipwood, but designate the latter simply as 'rosewood', which can sometimes cause confusion. Grenadilla is a beautiful, dark wood that resembles ebony but may have a bit more brown in the grain. Extremely tough and durable, grenadilla produces a tone that is bright, clear, and penetrating; many of our customers favor grenadilla instruments for solo and concerto work. If you have any questions about the materials we use or which wood is right for you, please do not hesitate to ask! Terminology: specific gravity: the ratio of the density of a sample of wood to its weight in water; woods with a specific gravity greater than 1 will not float. Heavier, denser woods tend to be more durable. Janka Hardness test: measures the force required to embed an 11.28mm steel ball into wood to half its diameter (go figure). Harder woods naturally require more force.